Until 1985 the George Rooms sat behind Charles Woodward’s Vancouver Main Street store that stood on the corner of East Georgia. The building was designed, as far as we can tell, by Townsend & Townsend for D C McLaren (of 646 Main Street) and built at a cost of $40,000 by E J Ryan. When it was built in 1912 East Georgia was still called Harris Street, and the building was described in the Daily Building Record as a five-storey brick store & rooming house. D C McLaren was a saddler and harness maker – the Museum of Vancouver has some of his work. He was also the Provincial Grand Master of the Orange Lodge of BC. David Carlson McLaren was born in Ontario in 1868, his wife Mildred came from Quebec, and in 1911 they had a 12-year-old son at home called Raleigh, who had been born in Kamloops in 1898. Mr. McLaren’s business was on Main Street, but he lived on Woodland Drive. David McLaren died in 1943, having last worked as a leather worker in 1922. His wife Mildred died in 1950, aged 83, and their son Raleigh McLaren died in 1966, aged 67, at Ganges in Saltspring Island, having worked in construction as a bridgeman according to his death certificate. The rooms changed name in the very early years. They started out as the Mori Rooms, but in 1914 they were the Apex Rooms run by Mr. McLaren himself – a name they retained into the 1920s. By 1975 the building had clearly deteriorated, but was returning (briefly) to active service as a 73-room SRO hotel. A Council report in 1975 on “Derelict Buildings in Skid Road – 205-15 East Georgia Street” stated that “The Fire Chief reports as follows: These premises are now fully sprinklered and at the time of writing this report the building is almost ready for complete occupancy. 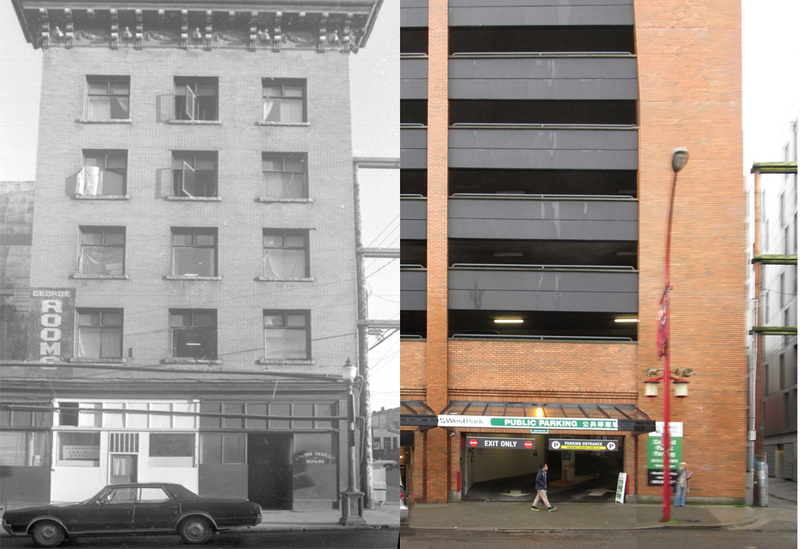 There are some minor routine Bylaw requirements to be completed but otherwise the premises may be occupied at any time.” The rooms continued in use until 1984, and were demolished in 1985 to make way for the 8-storey strata parkade, retail and office building that’s there today. Here’s Royal Mansions in the West End, on Pacific. It was built in 1912, but in 1938 when this Vancouver Public Library image was taken it was still in great condition. It was designed by a British-born father and son architectural team, Townsend & Townsend. They only used two colours of brick on their buildings; red and buff, but generally they liked to mix the two with huge diamond shaped red motifs on a buff ground. Uniquely, as far as we know, this is all red – and has some fancy rustic stonework on the corners as relief. The building permit says it cost $80,000 to build for M B Wilkinson. The Townsends were only in the city for a few years, from 1908 to 1913, but they were responsible for designing at least 25 buildings worth over $800,000 in that period. They may have come from Manchester, and disappeared from the city as the economy started to face serious decline. We think Alfred Townsend (who might have been christened Joseph, like his father) may have fought in the First World War, and possibly returned to the US after the war. This seems to be the most expensive project that the partners designed. 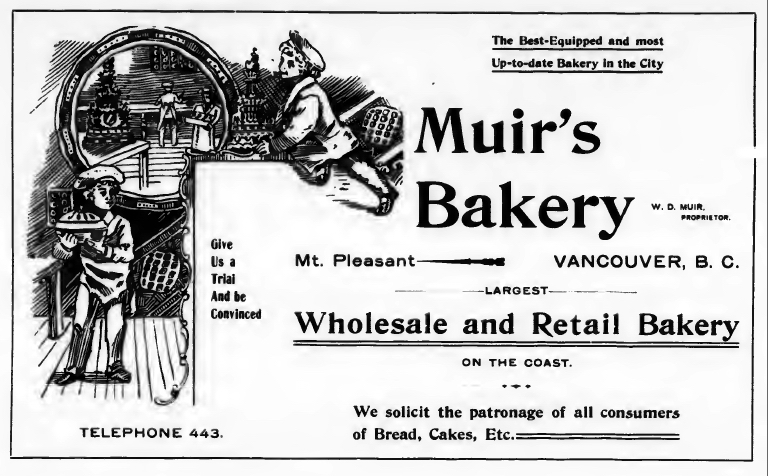 In 1887 a new company was incorporated – the ‘Vancouver Brick and Tile Company Limited’. The five Trustee shareholders made an interesting group: David and Isaac Oppenheimer, the Gastown merchants who controlled much of the land in the Old Granville Townsite, George Black; pioneer butcher who would become a hotel-owner, Sam Brighouse, one of the ‘three Greenhorns’ who bought 222 acres of land now making up today’s West End, and W H Armstrong – a local contractor. The Canadian Mining Manual for 1890-91 shows that the company – at least briefly – were in production, manufacturing 750,000 bricks in 1889, and that the company secretary was M B Wilkinson. A complicated court case that lasted for many years revealed the relationship between Mr. Wilkinson, and Mr. Brighouse, and their involvement in the Royal Mansions. Michael Wilkinson by the point the case was settled (in 1929) was known as Michael Wilkinson Brighouse – he changed his name as a result of a requirement of Sam Brighouses’s will. Michael was Sam’s nephew; Sam had no wife or children, Michael came to Vancouver in 1888 at the age of 24, settled with Sam on his Lulu Island farm, and eventually took over running Sam’s extensive business and property interests. Michael’s mother (Sam’s sister) kept house. 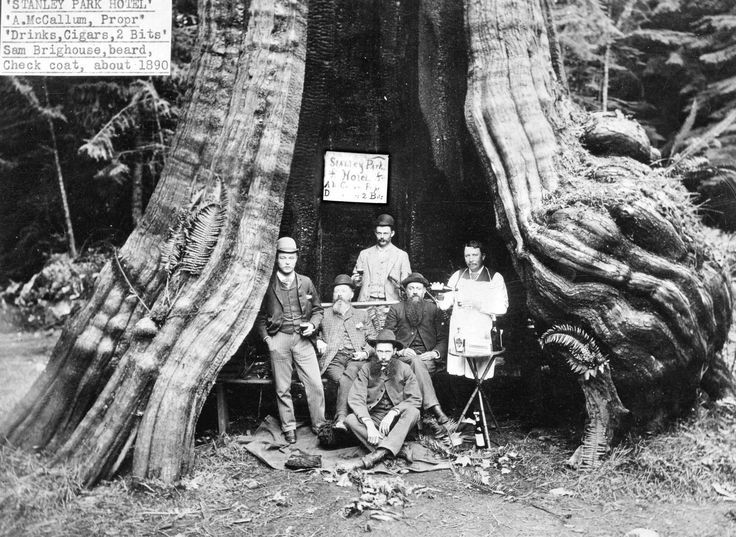 We know what Sam and Michael looked like from an Archives image that shows them setting up a bar in the hollow tree (something the Park Board haven’t contemplated). The photograph shows Michael Wilkinson, Sam Brighouse, William Beech, A. McCallum (serving drinks) and others around 1890. A 1906 will left most of Sam’s assets (worth over $700,000 at his death) to Michael, but Sam was ill a couple of years later, had a prostate operation in 1908 and returned to England in 1911 in poor health. He died there in 1913, soon after changing his will to leave Michael the Richmond farm (on condition that he couldn’t sell it), and all the other property to other relatives. The court case (brought by Frederick Morton on behalf of Sam’s estate) eventually determined that this final version of the will was the legal one, leaving Michael merely extremely well off, rather than very, very wealthy. It also showed that as well as managing a company called the Royal Ice and Dairy Company on his uncle’s behalf, in 1912 Michael had developed Royal Mansions at a cost of over $80,000 on Sam’s land. The judgement allotted Sam’s estate $30,000 of value and Michael and his brother Arthur mortgages of $25,000 each, on which interest was paid. The initial court case in 1916 created this arrangement – the final 1929 Supreme Court judgement appears to have reversed it. Michael ran Richmond’s Minoru Race Track on its opening in 1909, and he married – in 1921 the Daily World reported “Mrs. M. B. Wilkinson of the Royal Mansions entertained at the tea hour on Wednesday”. Here’s the Toronto Dominion Bank that used to stand on the corner of Robson and Burrard as it appeared in 1974. We’ve recently added a little more information on our previous look at this corner when it had retail stores built for Alfred Perry. In 1939 architects Palmer and Bow were hired to design the bank here – apparently two storeys instead of the single storey it replaced. In practice it was William Bow who was hired; his partner Bernard Palmer had died in 1936, but Bow kept the practice name unchanged. Bow was trained in Glasgow and headed to British Columbia in 1913 after he had come second in the design competition for the University of British Columbia. (Technically it was his brother who came second; William drew up the design, but it was entered in the name of his brother Douglas, who was already in Vancouver). The single storey retail store is almost certainly the Townsend & Townsend designed $1,500 brick store built by J P Foreshore for Mr Perry in 1911. There was another permit for an $800 addition issued only a week later than the first to the same architect and owner, so perhaps the building became a little more ambitious. The single storey retail stores across Burrard also date back to 1911, designed by Parr and Fee for Cicero Davidson. While that store lives on (with a contemporary façade), the bank was replaced in 1998 with a retail building designed by W T Leung.